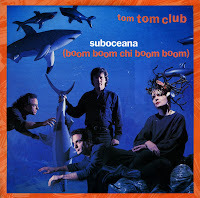 The music video of Tom Tom Club's Suboceana was a very strange one, one that caught my attention the very first time I saw it. I always wanted to have the single, but it was never available. In fact, I never even saw the single until I found this one. And so it came to pass that I had the 12" single before I found the single. Much to my delight, this single features an instrumental version of the track that is not included on the 12". 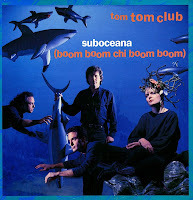 Tom Tom Club had two hits in the Netherlands: 'Wordy Rappinghood' (1981) and 'Under the boardwalk' (1982). I didn't buy either of them. I did buy this track, 'Suboceana' on a 12" single. It was a couple of years after I saw the interesting video. The single, of course, never reached the Dutch record shops, since this was released in the UK only. And so it was in the UK that I found this record. The 'Dream master remix' was made by Keith Cohen, the man who also founded and fronted K.C. and the Sunshine Band.